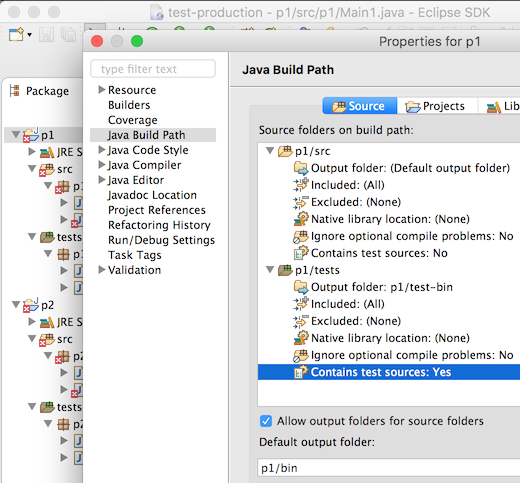 JBoss Tools also know as the Bring-Your-Own-Eclipse (BYOE) option requires at least Eclipse 4.8 (Photon) but we recommend using the latest Eclipse 4.8 Photon JEE Bundle since then you get most of the dependencies preinstalled. Our main focus for this release was on adoption of Java 10, improvements for container based development and bug fixing. 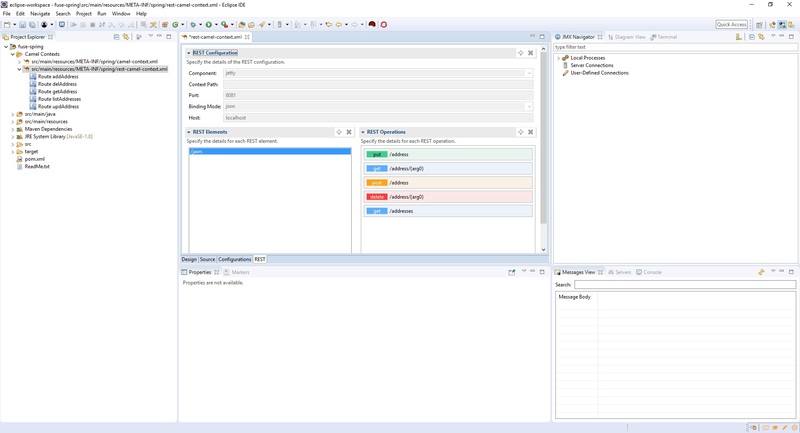 Eclipse Photon itself has a lot of new cool stuff but let me highlight just a few updates in both Eclipse Photon and JBoss Tools plugins that I think are worth mentioning. The Spring Boot runtime was already supported by the OpenShift server adapter. However, it had one major limitation: files and resources were synchronized between the local workstation and the remote pod(s) only for the main project. 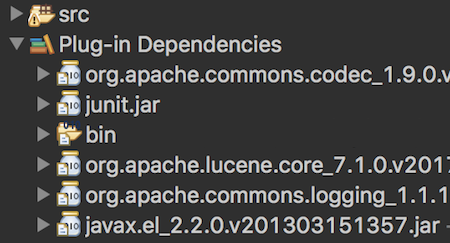 If your Spring Boot application had dependencies that were present in the local workspace, any change to a file or resource of one of these dependencies was not handled. Fortunately, this new release solves that! 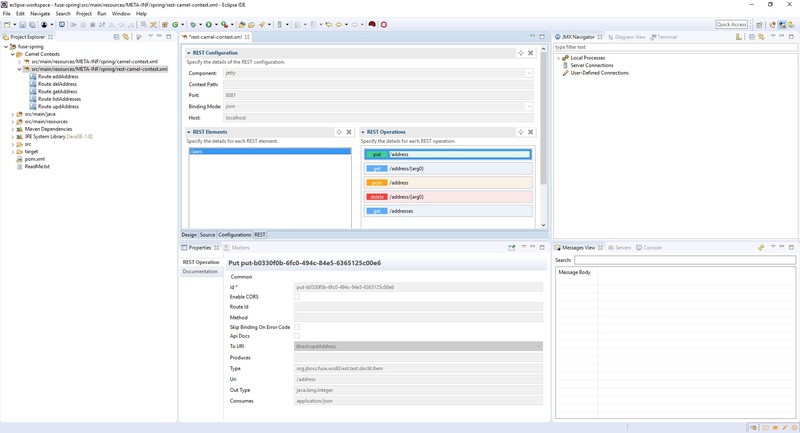 A server adapter has been added to work with Wildfly 13. It adds support for Servlet 4.0. There is a new “Camel Rest DSL from WSDL” wizard. 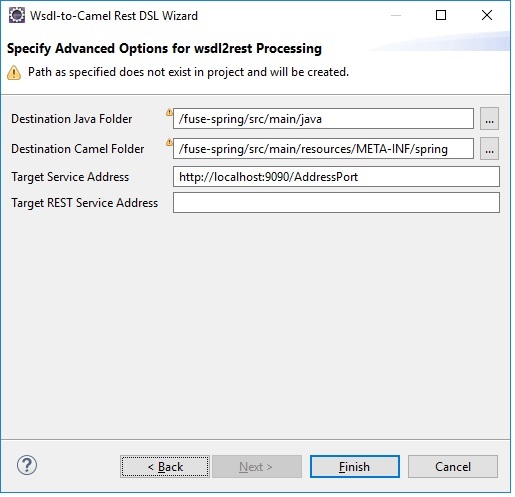 This wizard wraps the wsdl2rest tool now included with the Fuse 7 distribution, which takes a WSDL file for a SOAP-based (JAX-WS) web service and generates a combination of CXF-generated code and a Camel REST DSL route to make it accessible using REST operations. 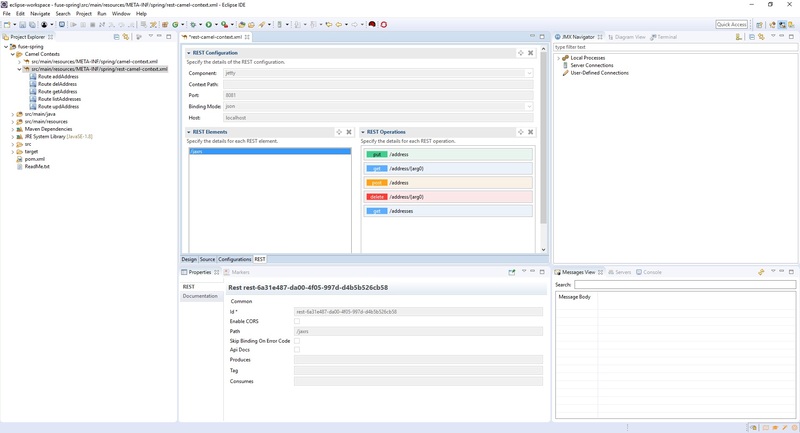 To start, you need an existing Fuse Integration project in your workspace and access to the WSDL for the SOAP service. Then useFile→New→Other…​ and select Red Hat Fuse→Camel Rest DSL from WSDL wizard. 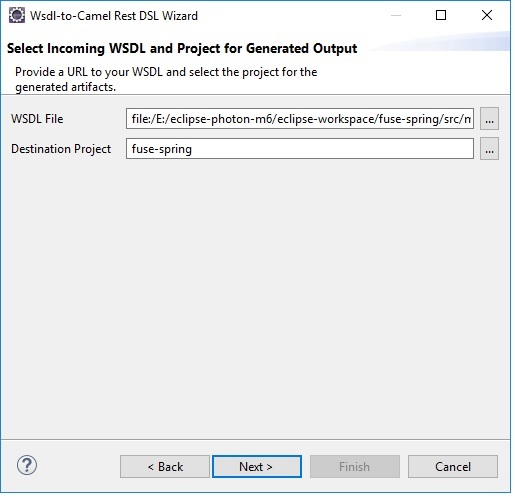 On the first page of the wizard, select your WSDL and the Fuse Integration project in which to generate the Java code and Camel configuration. On the second page, you can customize the Java folder path for your generated classes, the folder for the generated Camel file, plus any customization for the SOAP service address and destination REST service address. 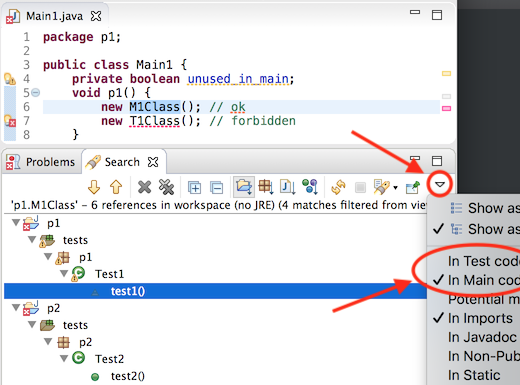 Click Finish and the new Camel configuration and associated Java code are generated in your project. The wizard determines whether your project is Blueprint, Spring, or Spring Boot based, and it creates the corresponding artifacts without requiring any additional input. When the wizard is finished, you can open your new Camel file in the Fuse Tooling Route Editor to view what it created. That brings us to another new functionality, the REST tab in the Fuse Tooling Route Editor. Details for the REST Configuration element including the component (jetty, netty, servlet, etc. ), the context path, the port, binding mode (JSON, XML, etc. ), and host. There is only one REST Configuration element. A list of REST elements that collect REST operations. A configuration can have more than one REST element. Each REST element has an associated property page that displays additional details such as the path and the data it consumes or produces. A list of REST operations for the selected REST element. Each of the operations has an associated property page that provides details such as the URI and output type. For this release, the REST tab is read-only. 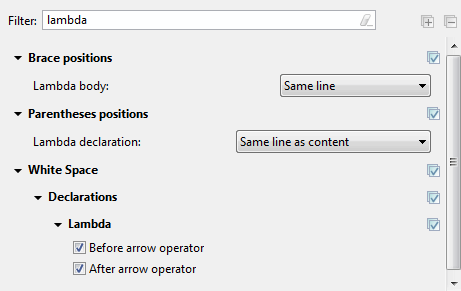 If you want to edit the REST DSL, use the Route Editor Source tab. When you make changes and save them in the Source tab, the REST tab refreshes to show your updates. As announced here, it was already possible to have Camel URI completion with XML DSL in the source tab of the Camel Route editor by installing the Language Support for Apache Camel in your IDE. 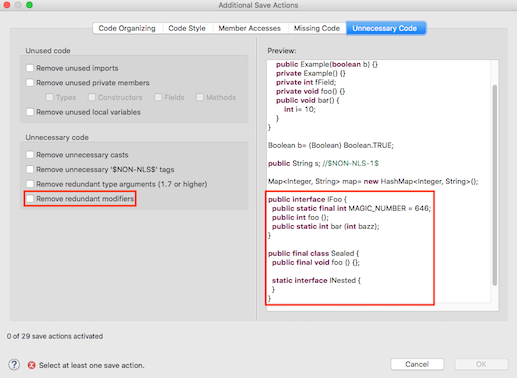 This feature is now installed by default with Fuse Tooling! The embedded Maven runtime is now based on Apache Maven 3.5.3. It is now possible to disable an archetype catalog. 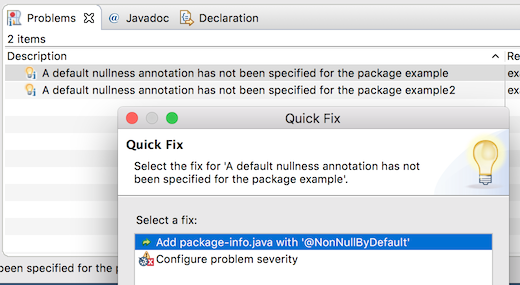 Support for Java 9/10 has been improved: bugs fixes, better handling of module path. 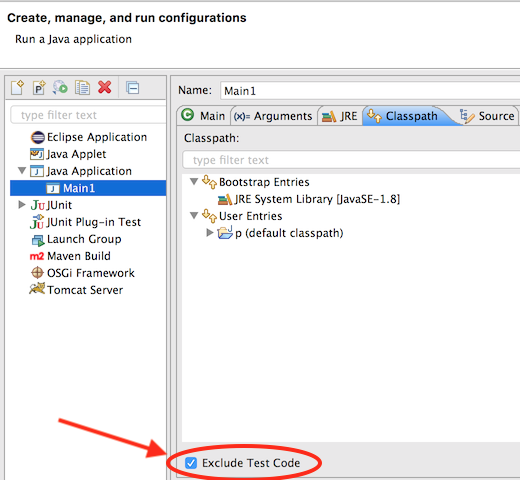 A quick fix Change project compliance and JRE to 10 is provided to quickly change the current project to be compatible with Java 10. You can now Ctrl+click or use Open Declaration (F3) on case or default keywords to quickly navigate to the beginning of the switch statement. To improve readability in the dark theme, bold style usage has been reduced and some colors that were too close to each other have been altered. The colors of links in code element information control now takes the color settings of the Hyperlink text color and the Active hyperlink text color from the Colors & Fonts preference page into account. The readability in the dark theme has been improved a lot by this. 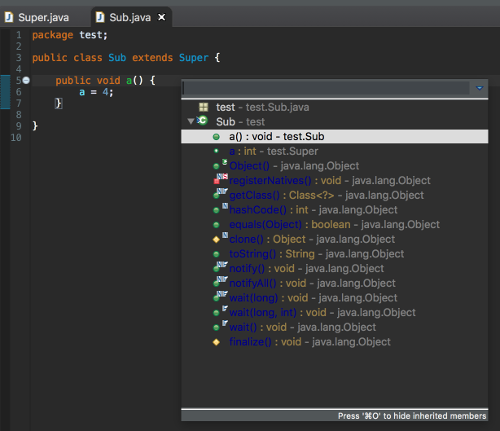 The Eclipse default dark theme now includes styling of inherited members in JDT’s Quick Outline. This improves readability in the dark theme a lot. 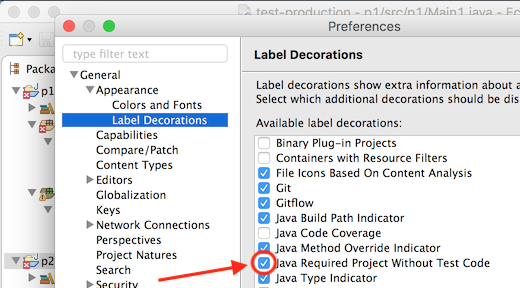 The color can be configured via the Java > Inherited Members color definition on the Colors and Fonts preference page. 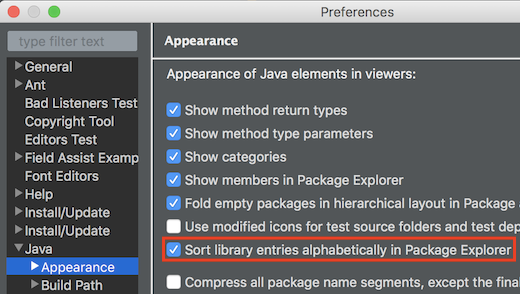 In the Java Build Path project settings, there is now an attribute Contains test sources to configure that a source folder contains test sources. (Note: test sources must have their own output folder). 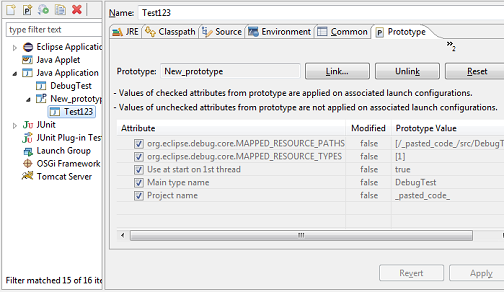 Similarly, for projects and libraries there is an attribute Visible only for test sources. This setting also exists for classpath containers, and if it is set to Yes for one of these, this value will be used for all contained libraries and projects. 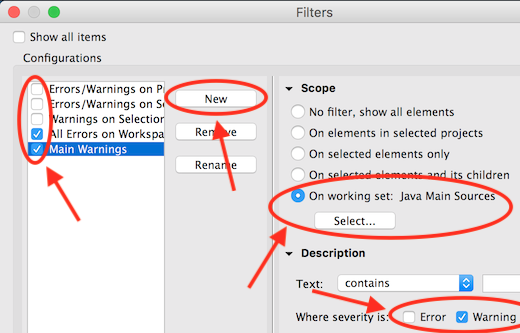 The Generate…​ dialogs of the Java tools have been adapted to use verbs instead of OK. This is an experimental support provided to allow the regular expression usage in search field while searching for module declaration. This can be considered as a wrapper of the API change. In the above example, all the characters trailing “/r ” form a Java regular expression to denote a module name which starts with zero or more ‘n’s followed by the string “.ver” and followed again by zero or more number of arbitrary characters. Another example would be to search for all modules that start with java.x followed by zero or more characters which is given by the regular expression /r java\.x. * – note the backslash for . to consider this as a “normal” character instead of the special regex]. Yet another example would be search for all module names that start with j followed by zero or more characters and ending with .xml which in regex language translates to /r j.*\.xml. Please note that here the first ‘.’ is the special regex character while the second ‘.’ is escaped to denote that this is a normal character. 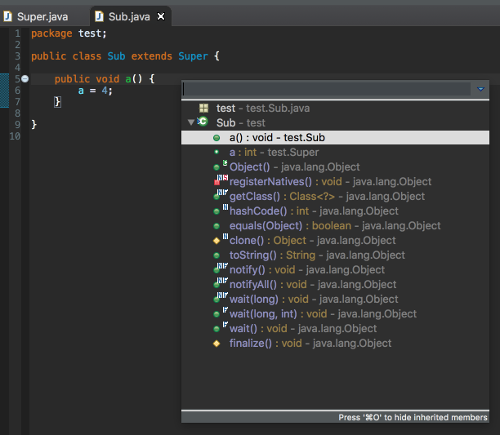 There is now support for running Java annotation processors on test sources. 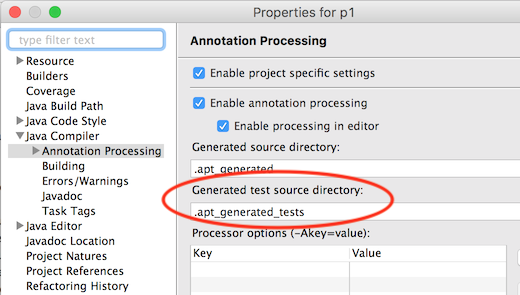 The output folder for files generated for these can be configured in the project properties in Java Compiler > Annotation Processing as Generated test source directory. 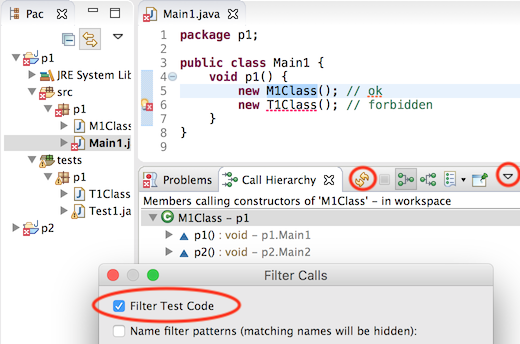 A new preference Compiler Compliance does not match used JRE is added to Compiler Preference Building Page. 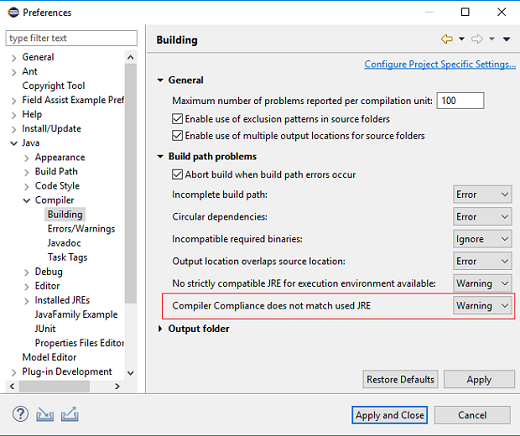 This preference indicates the severity of the problem reported when project’s used JRE does not match the compiler compliance level selected. (e.g. 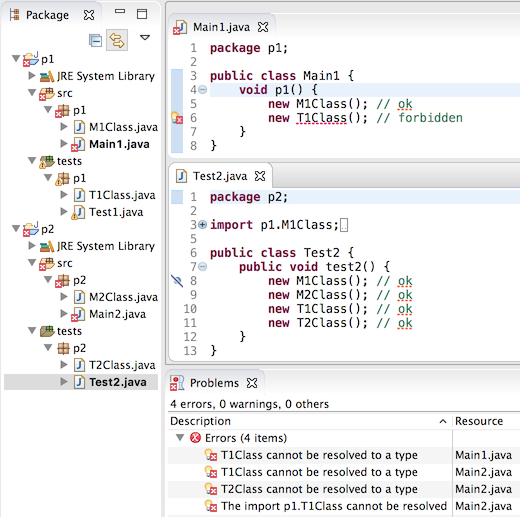 a project using JRE 1.8 as JRE System Library, and the compiler compliance is set to 1.7). 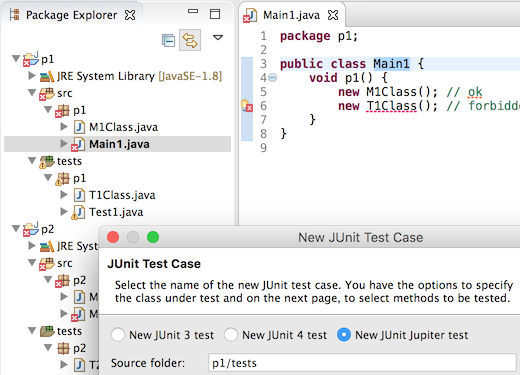 If the JRE being used is 9 or above and the –release option is selected and even if the compiler compliance does not match the JRE being used, this option will be ignored. The formatter profile preference page (Java > Code Style > Formatter > Edit…​) has a new look which makes it much easier to set preferences for formatting Java code. Instead of multiple tabs, all preferences are presented in an expandable tree. 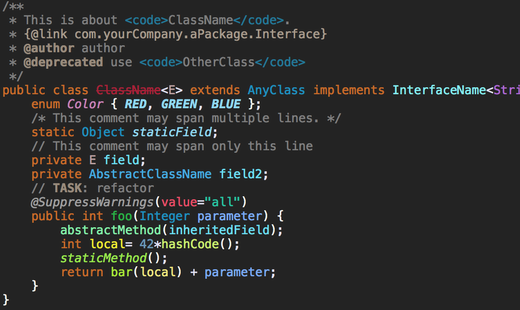 The formatter can now align names and/or descriptions in Javadoc tags in new ways. 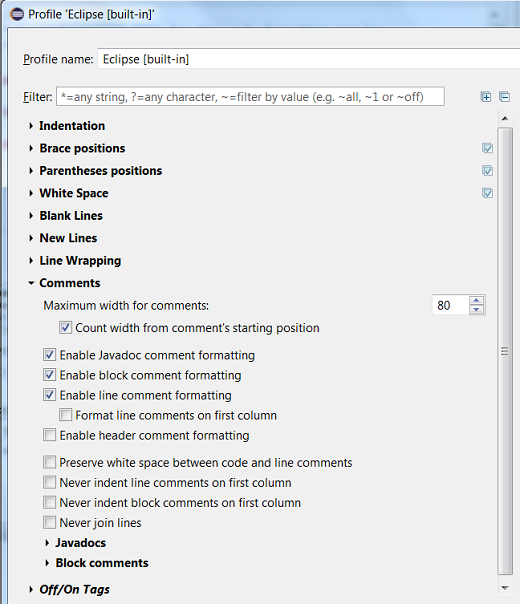 The formatter profile editor is available for selection, under Comments > Javadoc. The formatter preferences tree styling has been fixed to work properly in the dark theme. 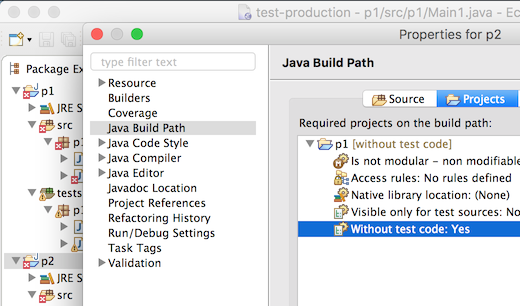 A Java Launch Configuration can now be based on a prototype. More precise advanced source lookup implementation, particularly useful when debugging applications that load classes dynamically at runtime. 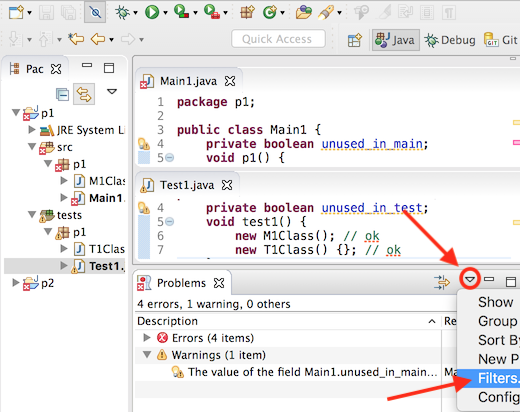 Debug view now automatically updates thread names if they are changed in the debuggee JVM. This shows live information for worker instances, as described above. 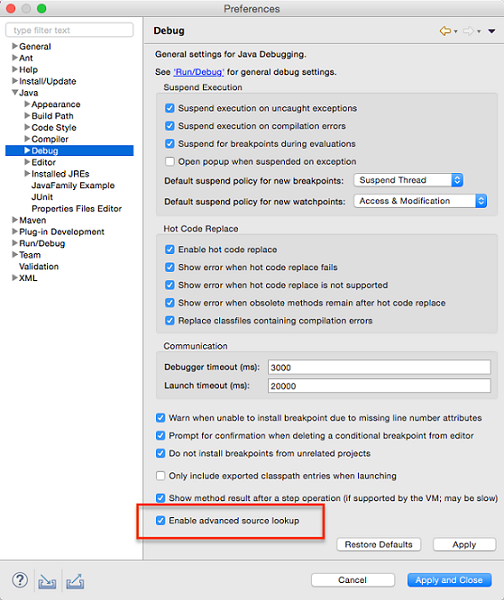 When a method exit breakpoint is hit, the value being returned is now shown in the variables view. The Display view has been renamed to Debug Shell to better match the features and purpose of this view. 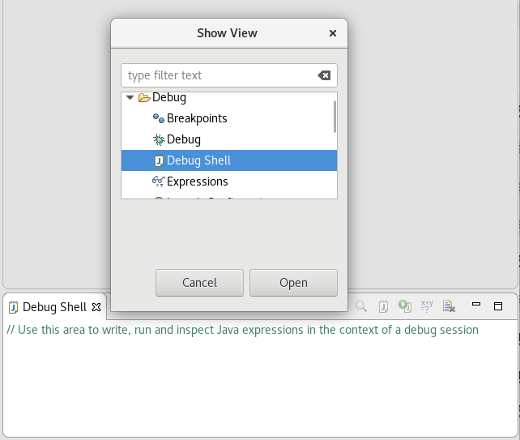 Also, a java comment is shown in the Debug Shell on fresh open that explains when and how to use it. 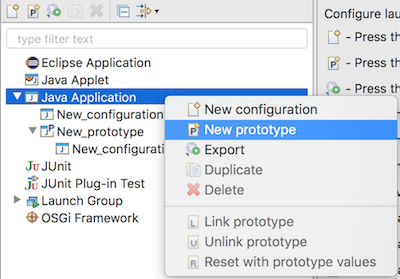 Now that JBoss Tools 4.6.0 and Red Hat Developer Studio 12.0 are out, we are already working on the next release for Eclipse 2018-09.